Emblematic of strength and longevity, white oaks grace the deciduous forests of eastern North America. White oaks are robust, deciduous, forest trees, commonly attaining heights of 20 – 25 m. Bark is pale gray and wood is nearly white to pale brown. 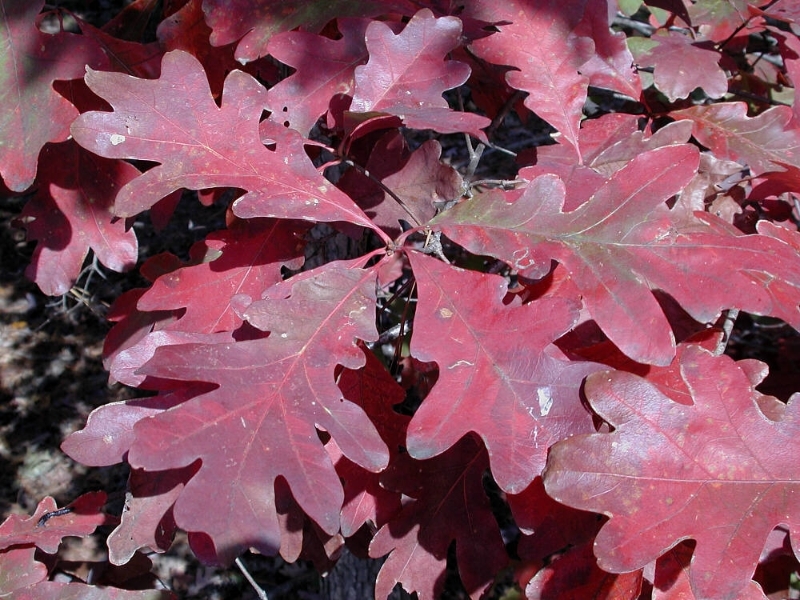 Leaves are alternate, but as in many oaks, they tend to cluster near twig tips. Petioles are short, 0.8 – 2 cm long, compared with the 10 – 25 cm leaf blades; leaf margins bear rounded lobes of varying depth, sinuses between lobes extend halfway, or more, to mid-veins; newly emerged leaves (and stems) are white-wooly and sometimes tinged with red; early-season hairs are quickly shed, resulting in distinctive bi-colored mature leaves, green above and whitish below; leaves turn reddish in fall and some brown leaves are retained on trees through winter, particularly those on saplings or lower branches of large trees. Mature trees flower in spring roughly concurrently with leaf emergence. Flowers are unisexual and minute, with male (staminate) and female (pistillate) flowers produced on the same tree; hence, trees are characterized as monoecious. 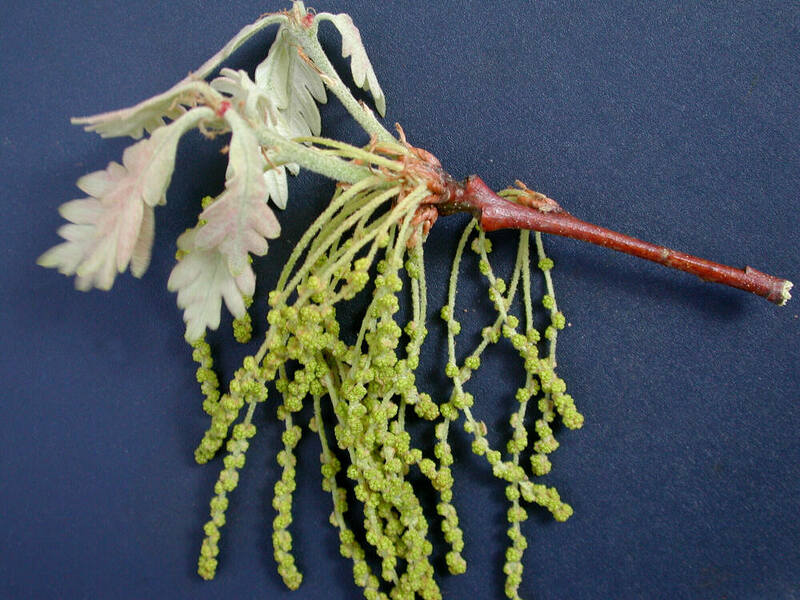 Male flowers, little more than a few stamens and rudimentary sepals, are massed in clusters on essentially naked catkins that arise from buds produced on previous season’s growth; at first male flower clusters are nearly contiguous, but they soon become separated by elongation of the catkin axis; once pollen grains have been released into the wind, the whole catkin is promptly shed. Female flowers are borne in clusters of three or four, sometimes fewer, near tips of short spikes that arise from axils of newly developing leaves; at pollination stage these flowers appear to be sessile in leaf axils, but within a few weeks subtending peduncles elongate to a length of up to about 2 cm, and that length is maintained throughout maturation of acorns. Female flowers consist of three stigmas emerging from a cupule, the structure that eventually forms the acorn cap; observation of further details requires magnification and dissection. White oak acorns mature in a single growing season, becoming 1.5 – 2.2 cm long, with knobby-surfaced caps that cover less than half the acorn. of Central America and southeast Asia. Within the genusQuercus, white oaks and their closest relatives (for example, chestnut oak, post oak, swamp white oak, etc.) 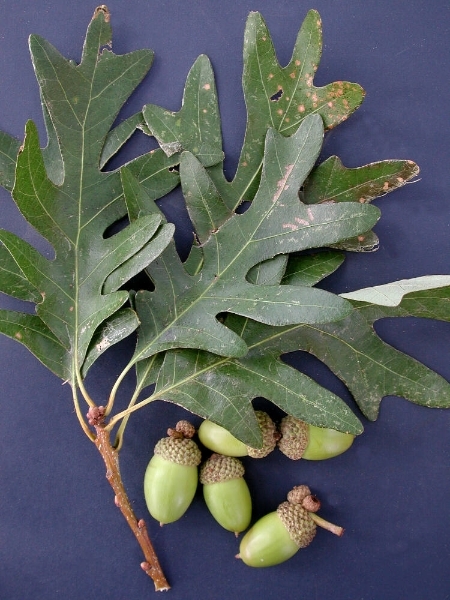 constitute subgenus Quercus, colloquially known as the white oak group, characterized by rounded leaf lobes and acorns that mature in a single season. Along with chestnuts (Castanea) and beeches (Fagus), oaks are classified in the family Fagaceae. Wherever they occur, oaks constitute one of the most important sources of hardwood timber, and the properties of white oak wood make it particularly prized. Like that of other oaks, the wood is hard, dense, and durable and thus xsuited for myriad uses from rough construction to floors, interior trim, and furniture. Also true of oak wood in general, the combination of prominent growth rings and large rays provides attractive grain and figure in finished woodwork. Unlike that of red and black oaks, the heartwood of white oak has tyloses, microscopic bubble-like obstructions that block the pores; these tyloses render the wood capable of resisting liquid penetration and make it relatively resistant to decay. Consequently, white oak was valued historically for shipbuilding and is still valued for the making of wine and whiskey barrels. In addition, thin splits of oak wood can be crafted into sturdy and durable baskets. 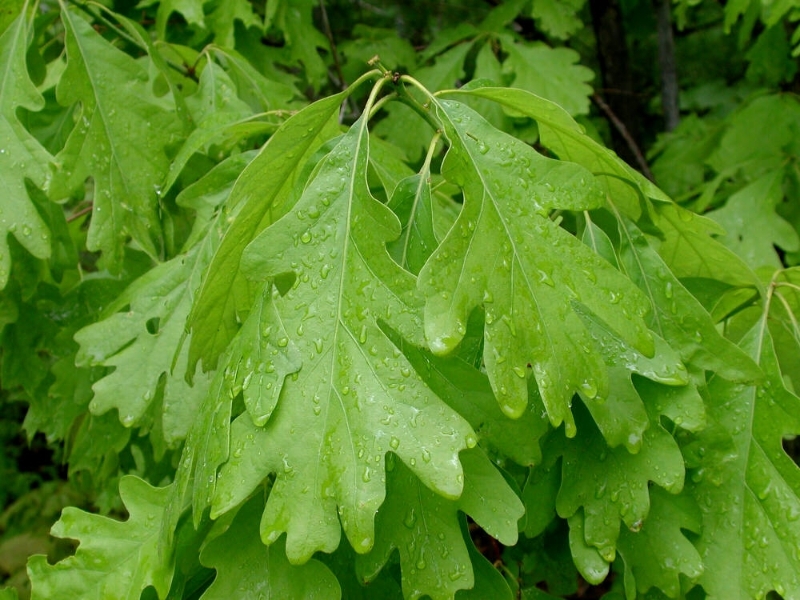 Quercus albaoccurs naturally as one of the dominant tree species in forest communities of eastern North America. It can be found on acid to alkaline soils from ridge tops to the relatively moist soils of bottomlands, from near sea level to elevations over 5,000 feet in the Appalachians. 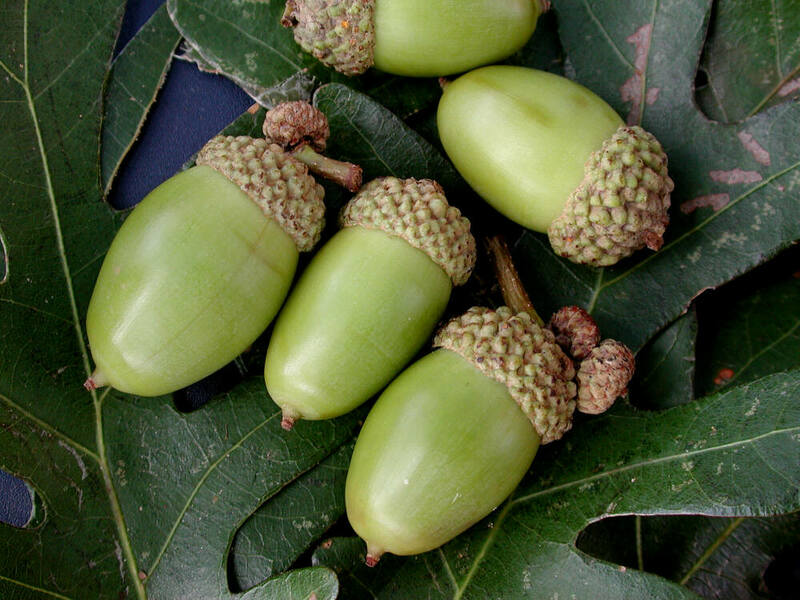 The acorns are sweeter than those of red and black oaks; they are thus eaten by many herbivorous birds and mammals; white oak acorns were also consumed by Native Americans. Deer browse the branchlets in winter and myriad insects also live on white oaks, notably several that produce curious stem and leaf galls. 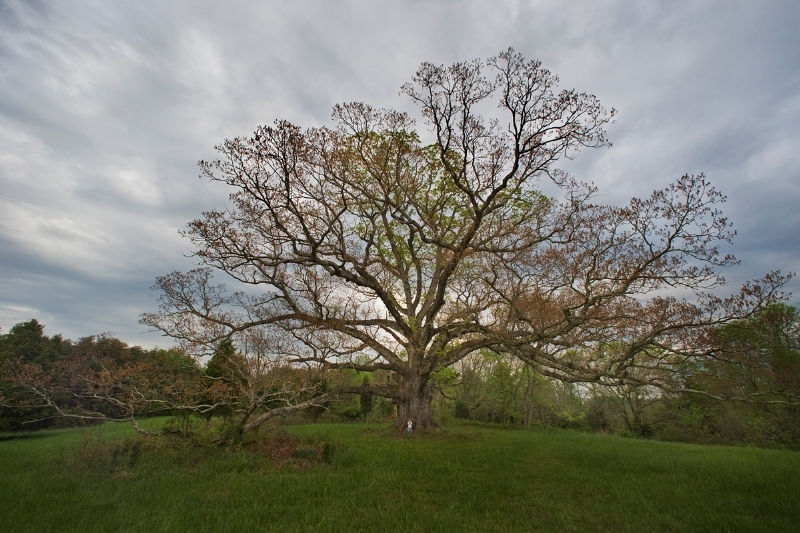 Rare specimens older than 600 years are known, but most large white oaks are probably no more than half that age. Specimens grown in the open typically become as wide as they are tall, with massive limbs and pleasing architecture. White oaks grow slowly, thus accentuating the value of large specimens. Acorns sown immediately after collection in the fall germinate readily. White oaks have taproots that must be accommodated carefully to ensure successful transplanting, which becomes progressively more challenging as saplings age. 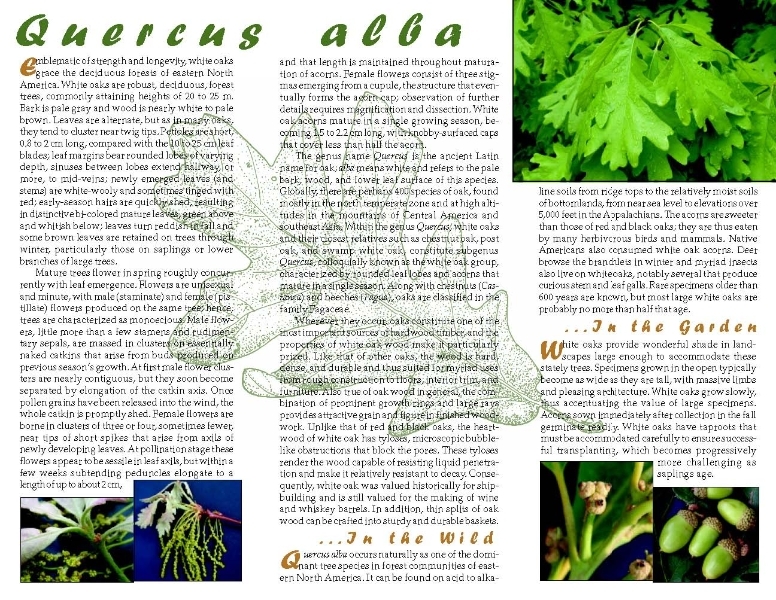 Quercus albacan be found from Maine to Florida, west to Texas and Minnesota, essentially throughout the temperate deciduous forest biome of eastern North America; it is found throughout Virginia. White oaks are both widespread and abundant suggesting a secure conservation status for this noble tree. However, there are concerns about an exotic fungal pathogen,Phytopthora ramorum, the causative agent of a disease ominously known as sudden oak death;Quercus alba is known to be susceptible, but as yet, no widespread infections have been documented in its natural range. Excessive browsing of saplings is a concern in regions overpopulated by deer. 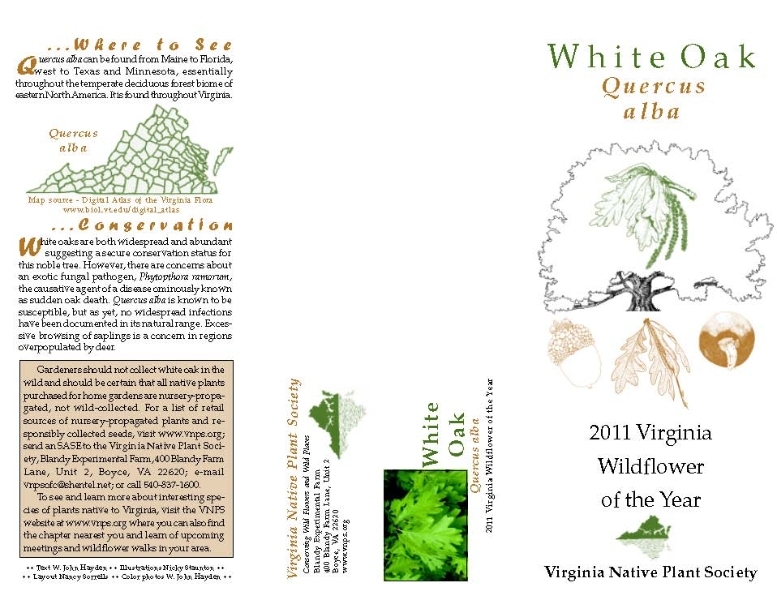 Gardeners should not collect white oak in the wild and should be certain that all native plants purchased for home gardens are nursery-propagated, not wild-collected. For a list of retail sources of nursery-propagated plants and responsibly collected seeds, see elsewhere on this website. Text from 2011 Wildflower of the Year brochure written by W. John Hayden and adapted by him for the web. January 19, 2010.